It’s hard to believe it now, but once upon a time Indians had a far bigger appetite for outbound M&A than their Chinese rivals. That was just before the 2008 financial crisis, which dealt a body blow to India Inc.’s global ambitions. Then, in quick succession, came the credit-fuelled growth of China’s state-owned enterprises; the yuan’s appreciation; a string of corruption scandals in India that bred a climate of distrust in 2013 and 2014; and the subsequent meltdown in commodity markets, which hurt the more internationally active Indian buyers. The tables have now turned so comprehensively it will be difficult, if not impossible, for the rankings to reverse. Even last year, when Beijing was clamping down on Chinese firms’ shopping for trophy assets—like Anbang Insurance Group Co.’s purchase of the Waldorf Astoria or Dalian Wanda Group Co.’s takeover of Legendary Entertainment LLC—mainland buyers still ended up committing $144 billion to assets outside of China or Hong Kong. India’s tally was a paltry $5 billion. Still, as the juggernaut of Chinese M&A rolls on (minus the flashy deals for which communist leaders have developed a distaste), Indians may not be down and out for too long. That’s the message from Kumar Mangalam Birla, whose Mumbai-listed Hindalco Industries Ltd is bidding for US aluminium producer Aleris Corp. According to Bloomberg reporters George Smith Alexander and Bhuma Shrivastava, the deal could value Aleris at about $2.5 billion, including debt. The last time Birla attempted anything this bold was when he paid $5.7 billion for Novelis Inc., the vehicle he’s using now to buy Aleris. That was 11 years ago. The timing is impeccable. The automotive aluminium market is forecast to grow at a rate of 8.8% a year in the decade through 2026, driven by tougher fuel-economy standards. More than 40,000 new commercial jets will be delivered over the two decades through 2036, according to Boeing Co., representing another major source of aluminium demand. Alcoa Inc.’s 2016 split from Arconic Inc. was predicated on the idea that the latter’s downstream business—which, like Aleris, provides specialized parts to key industrial users—would outperform the other unit’s smelting of commoditized primary aluminium. Then on Thursday, Birla announced a plan to pump a little more than $500 million into his highly leveraged Indian telecom venture, which continues to hemorrhage amid intense competition from billionaire Mukesh Ambani’s Reliance Jio Infocomm Ltd. Confident that his Idea Cellular Ltd, which is merging with the local unit of Vodafone Plc, will be among three mobile operators to survive the bloodbath, Birla is bringing in fresh equity. This signals an inflection point. In 2013, the scion of the 150-year-old business family caused a flutter by telling Bloomberg News that India’s heightened uncertainty and lack of policy transparency were the worst among the 36 countries in which the group operated; he would rather invest overseas, Birla said then. He didn’t quite make that splash abroad. Unlike Thai tycoons who are buying insurance against military control of their country by acquiring assets from Singapore to Vietnam and Myanmar, it’s important for the likes of Birla and the Tata group to do well at home—that’s what gives Indian entrepreneurs the confidence to make big moves overseas. Take Anil Agarwal. Just two years ago, 2019 dollar bonds of the aluminium czar’s Vedanta Resources Plc were trading at less than 50 cents on the dollar. 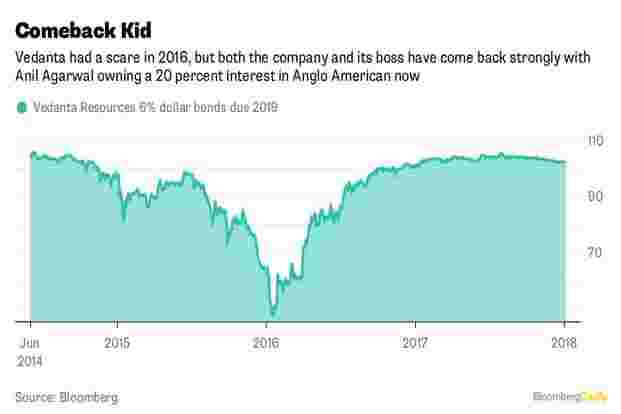 After zinc prices doubled in a year, Agarwal came back as strong as his bond, and rewarded himself with a 20% stake in London-listed Anglo American Plc, becoming its largest shareholder. Nobody knows what he wants to do with Anglo. For clues, though, watch his bid to put together an Indian steel empire by plucking assets out of bankruptcy. If he’s successful, Agarwal could launch a global play in mining and metals. The other Agrawal to watch spells his name like that. The first challenge for Saurabh Agrawal, who left Birla’s camp last year to become chief financial officer of the $105 billion Tata group, was to exit telecom and stabilize a troubled European steel unit. As cost savings from merging that business with Thyssenkrupp AG’s metals division materialize, expect Agrawal to slowly put Tata, the owner of Jaguar Land Rover and Tetley tea, back in the game as a buyer of global assets.